US, 1943, 67 minutes, Black and white. Stan Laurel, Oliver Hardy, Edgar Kennedy, Jacqueline White, Horace Mc Nally, Donald Meek, Henry O’ Neill, Russell Hicks. 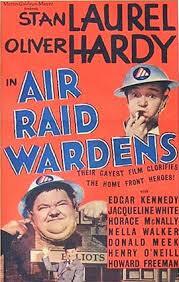 Air Raid Wardens is Laurel and Hardy’s contribution to World War Two morale? They portray themselves in a small American town, Stan being put upon, weeping, awkward, while Oliver Hardy is of course bumbling as well as authoritarian. They have failed in all their businesses, but their bicycle shop is bought by Donald Meek – who portrays an undercover Nazi spy, in league with a Nazi ring, planning to destroy a magnesium plant in the town which will halt the war effort. Stephen Mc Nally, appearing as Horace Mc Nally, is the sympathetic editor of the local paper in charge of defence. Jacqueline White is his journalist colleague. The film shows the bumbling mayor of the town who becomes the victim of many of Laurel and Hardy’s mishaps, especially in their work as wardens. His wife is also the victim of mishaps. The film shows the spirit of defence in America, fearing invasion from the Japs, fearing Nazi cells. There is a lot of slapstick comedy in the Laurel and Hardy fashion. The film draws on their traditions of comedy as a contribution to American morale in 1943.